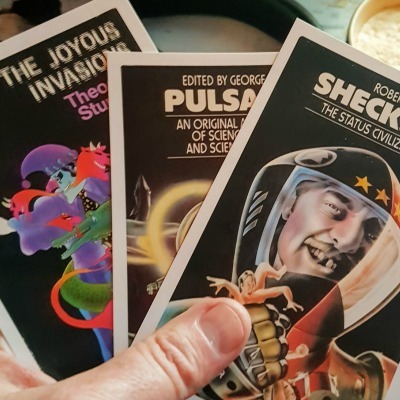 Grab Your Hand Written Science Fiction Postcard! Carmelo Rafala’s work has been published in various venues, including the following anthologies: Stories for Chip: A Tribute to Samuel R. Delany, Submitted For Your Approval, the Anthology of European SF The Fourth Science Fiction Megapack, Rocket Science , and The West Pier Gazette and other Stories. His work has recently been translated into Romanian. By day, Roberto Suarez works as a community college student advocate and recruiter. By night he geeks out on all things fantasy and science fiction, comic books and board games He is the co-host and producer of A Pod of Casts: The Game of Thrones Podcast and the new Radio Westworld, a podcast dedicated to HBO’s latest science fiction series. You can find Roberto on the web at robertosuarez.me, or on Twitter as @PuertoGeekan.